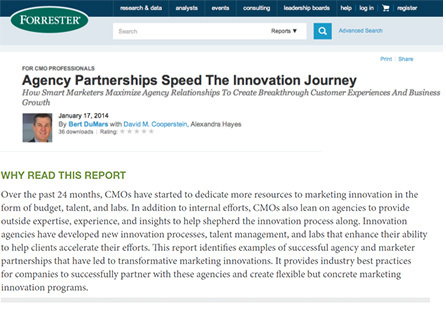 Bert DuMars with David Cooperstein and Alexandra Hayes published a piece for Forrester, Inc. that explores how marketers use agency relationships to drive innovation and business growth. Isobar is cited as a multidisciplinary organization able to move quickly from ideation to creation and then product launch. Use a multidisciplinary organization model to scale innovations faster. Visit Forrester to access the entire report here.